cat eyes & skinny jeans: Mary Jo Matsumoto Debuts Laid-Back Luxury...And I Need It! Gorgeous bags. Thanks so much for sharing. I love the color-blocked bags! Love the first pic--the dress and bag! Love her bowlers. What a fascinating piece to have. Especially, the bright primary colors. The tote in the blue with the neon piping is so cool. Hey! I like these fashion pics :) very lovely indeed. I haven't always been a huge fan of the clutch bag - but seeing all these neon colours coming into style makes me want one! I'd be happy with any of her items. There is a certain elegance in all of her designs. I really like the color blocked bowler bag in the second picture. I love when I have bags that can carry all of my stuff and the kitchen sink. Love MJ and her bags, especially the bowler! I am sooo in love with that tote! Goodness! I love the color and fabrics of these bags especially. The last one is simply darling! These are ADORABLE!!! I really love the bag and the second clutch. How did I not know about these?!? Thank you Erika, for featuring my bags today! I really feel like you captured the essence of my new line. Many many thanks! I agree with Karl's quote above. I'll have the second clutch please. Well said! 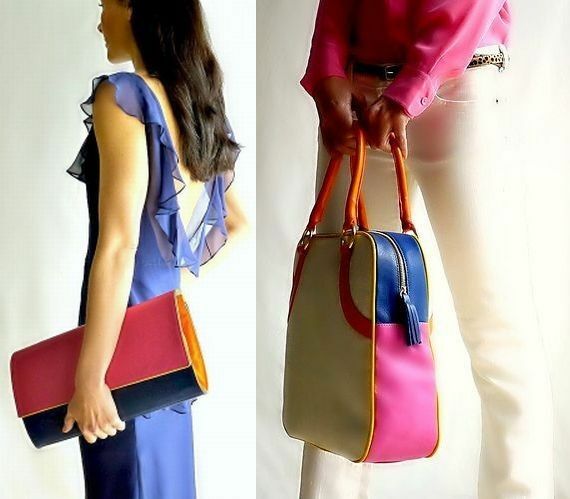 Love these beautiful bags! I love these bags. The colors are so gorgeous! Mmm I'm liking this inspiration of hers! Produces great things. The colours are so vibrant...a great pick-me-up. Lovely bags!! i am so loving that first clutch! Those bags are gorgeous!! I love the turquoise clutch. Love that quote! Those clutches are really cute, too! oh gosh, they are SO pretty, especially with the neutral pallet on the last girl. I think i would go with that one- the teal one! Spring is the perfect time for a colorful clutch!